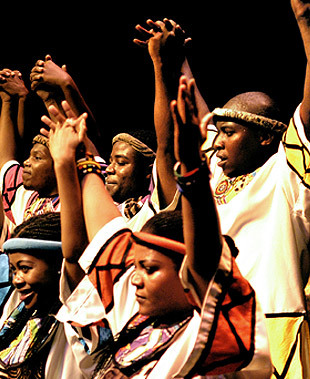 Direct from South Africa, the Soweto Gospel Choir is a unique and awe-inspiring vocal ensemble, performing in 5 different languages with inspirational programes of tribal, traditional and popular African and international gospel songs. Earthy rhythms, rich harmonies, acapella and charismatic performances combine to uplift the soul and express South Africa’s great hopes for the future. Since the choir began in early 2003, they have toured the world performing nightly to standing ovations, sold-out houses and rave reviews. 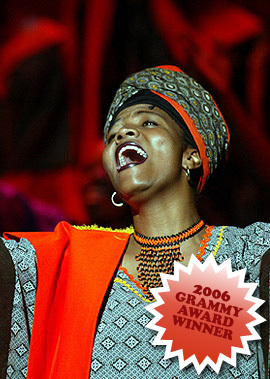 The multi-award winning Soweto Gospel Choir added another accolade to their impressive successes when their second album ‘Blessed’ recently was awarded the prestigious 2006 Grammy Award for Best World Music (traditional). The Choir has performed at some of the world’s most prestigious concert halls including; Carnegie Hall in New York, Sydney Opera House, Palau de la Musica in Barcelona, Carre in Amsterdam and Royal Festival Hall, London. A highlight includes the opportunity to perform onstage with U2’s Bono, Anastasia, Queen, Peter Gabriel, Cat Stevens and Annie Lennox to an audience of 26,000 at Nelson Mandela’s AIDS Fundraising concert, Cape Town December 2003. But the two greatest fans of the choir and their music have been their spiritual fathers, the Choirs Patron, Archbishop Desmond Tutu and the father of their nation, Nelson Mandela, for whom they have performed for and celebrated with on many occasions. In December 2013, the Choir were deeply honoured to be invited to commemorate Madiba's life at memorial services in South Africa, followed by New York and in London. "Nothing can really prepare you for the riot of exuberance and depth of emotion"
"Sheer jubliation…earthy and unrestrained…the rhythm of life"
"…both meticulously arranged and gutsy, from its hearty bas harmonies to soloists whose sharp-edged voices leap our of the choir." 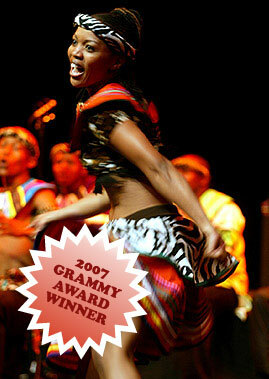 "The Soweto Gospel Choir is wonderful!!! You have never seen or heard such inifectious joy – guaranteed!!!"